Designed and built to the classic Peter Teal design. Since Peter Teal made the first set many years ago, the classic Wool Blending Hackle has been widely copied. We've worked closely with Peter to re-create his original design, and even making a couple of minor improvements along the way. 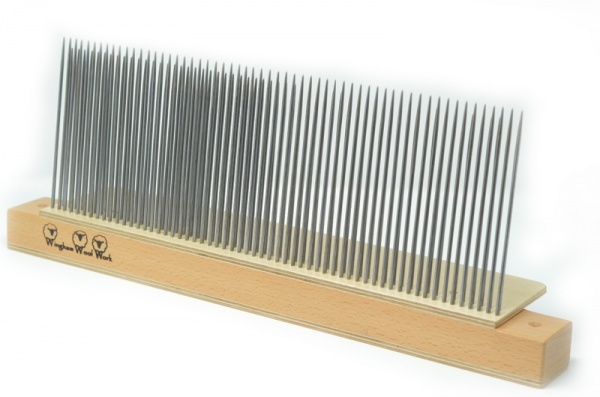 As such we're confident that we can offer the best hackle on the market today. Great for blending combed tops both natural and synthetic to produce your own unique blends. We only use hardwood from sustainable sources for our equipment, not only the hackle but across the entire Wingham Equipment range. 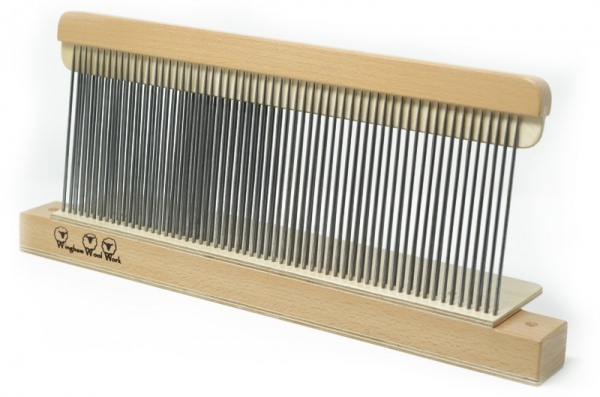 Two parallel rows of tines give a working width of 40cm and are securely set into the unit, 3mm thick and produced from harden steel stock. It's rare for these tines to be bent, but to ensure you get years of use from your hackle we've included a tine straighter, just to be sure. Each set also comes with a protective top piece to guard against any damage when not in use. Finally we include a three-hole diz to draw off your blend once completed. 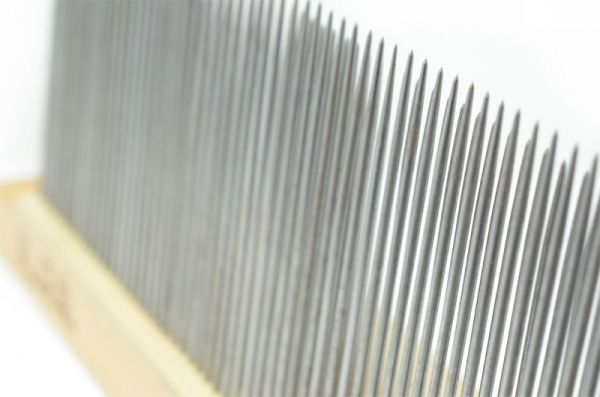 Note: The hackle is designed to be used clamped to a table in order to provide a solid base to work with. We don't include the clamps as the additional weight would mean you'd end up paying a lot more for postage. Steel "G-Clamps" are available from any high street DIY store. Alternatively there a two pre-drilled holes at either end of the base unit if you would prefer to screw the hackle straight to the table.